Another Columbus Day, another round of arguments at the intellectual level of 1066 and All That. 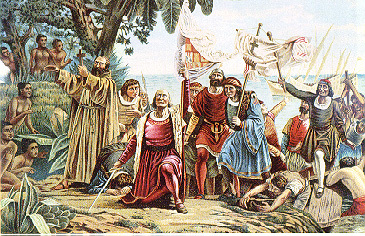 Was Christopher Columbus a Good Thing or a Bad Thing? It all depends on your POV. The meaning of the Columbus story, like any story, can be whatever you like. It’s more interesting if you let it tell itself to you from all possible points of view, and then thread your way through them. The greater the number of threads, the subtler the story. A single POV might yield a genre pot-boiler. Conquering hero braves disaster, nearly dies, wins new continent, bestows Civilization on benighted heathen. Alternatively, noble savages (variant: sophisticated though low-tech culture) welcome strangers; strangers turn out to be pox-ridden thugs; lovely hemisphere and its people ravaged; reparations now due. Suppose we mix in a little more back story. Christopher knows the world is round. Educated Europeans did know that. Facing east, you go overland to India. Facing west, you cross the sea to India. Then it turns out that there is a whole New World in the way. “New World” wasn’t a metaphor. It wasn’t a new planet, but it was so huge, so different, so strange and hence so dangerous that it might as well have been. Monsters and marvels that had floated in medieval minds for centuries instantly crystallized into stories about the New World. 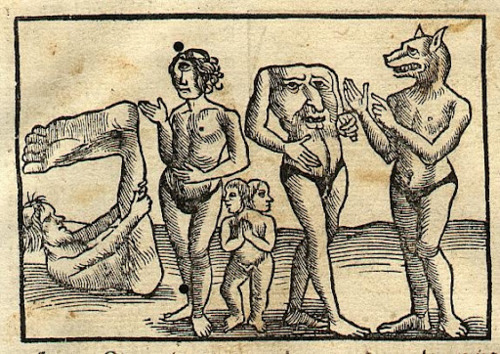 There be blemmyes, headless men with their faces in their chests! There be monopods, single-legged men who lie on the ground in the shade of their enormous, single feet! A writer could do better than sci-fi with that. Imagine exploring a place full of actual dangers – venomous snakes and fanged beasts whose habits you don’t know, a population rapidly learning that they might be better off without you – while behind every bush you know that an unhuman human might lurk. Imagine a stream of consciousness that holds both kinds of knowledge with absolutely equal certainty. Or take the sci-fi angle from the other side. 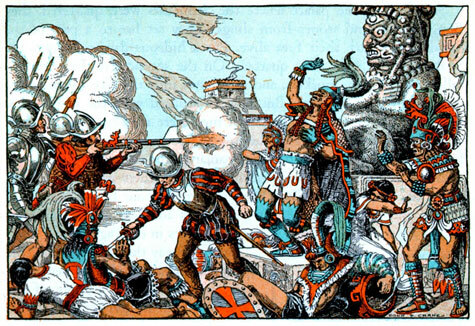 The Spanish chroniclers thought the welcome they received meant that the native population thought the conquistadors were gods. Maybe, maybe not. But what if they, or some of them, did think Quetzalcoatl had returned? Seriously. If you are or have been religious, what would you do if you met your god, embodied, right here and now? How would you imagine the likely future? 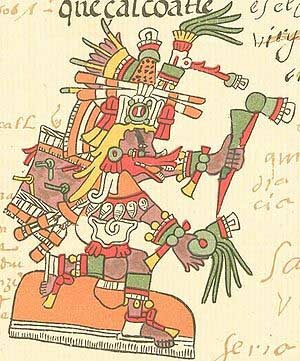 How would you imagine it if your god were Quetzalcoatl? And why confine yourself to the humans? What stirred in the mind of the Spanish horse who first saw the Argentine pampas? Europeans introduced the domestic cat to the New World. What delicious new prey for the jaguar! What an Armageddon for the voles! It must have been like two galaxies colliding. Slowly, over the centuries, they interpenetrate. Columbus Day focuses on the explosions. A better story might explore all the gravitational pulls. Then – if you tell it all carefully enough and honestly enough – like any story, its meaning can be whatever you have learned. Posted on October 10, 2016, in Heidi Wilson, Point of View, Uncategorized and tagged blemmyes, Columbus Day, monopod, New World, Point of View, Quetzalcoatl. Bookmark the permalink. 4 Comments. Glad you liked it, Triss! I see you write about an academic who solves mysteries! So do I. Weird people, aren’t they? More evidence of the importance of POV. I enjoyed reading this, thinking about the possibilities inherent in this familiar (or so I thought) story. What possibilities did you come up with, Sandy? The blog was just my first dry run on the question.